Quality child seats allow family style dining establishments to keep children safe, without sacraficing style. Available in plastic or wood, and in a variety of finishes to suit many aesthetics, child safety seating is essential. Barstools are great for dining counters as well as bars, and can be made of wood for a classic look or metal and vinyl for a retro look. 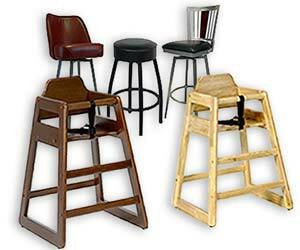 Available with out without a back, barstools provide essential seating. No matter the establishment, there is a beautiful, quality chair that can provide guest comfort while enhancing decor. From metal chairs to all wood chairs, and fully upholstered chairs, any restaurant can benefit from the right chair. Furnish your outdoor dining space with weather proof furniture. For restaurant patios and pool side cafes, there are tables, chairs, and accessories to fit any budget and style. Keep front-of-the-house staff organized and efficient with a waitress/hostess station that is not only functional but also attractive. Keep essential items close at hand, and provide guests a easily identifiable point of contact.